Sept. 30, 2009, 10 a.m.
By Mac Slocum @macslocum Sept. 30, 2009, 10 a.m.
You’ve still got two weeks to come up with the brilliant idea that’ll save journalism — or, to be more realistic, an idea that’ll earn some Knight Foundation cash and let you try something new and innovative. And unlike last year, you can choose to keep that idea secret until the cash arrives. That’s because the 2010 Knight News Challenge includes a private submission option, which allows proposals to remain secret from the date of submission until the News Challenge’s winners are announced in June. And people are taking advantage: While exact numbers are in flux as applications come in, as of late last week between 30 and 40 percent of applications had arrived via the new “closed” category. Last year — the third round of the News Challenge — all applications were public from submission through the multistage judging process. That was itself a shift from the previous year, when Knight included a category for commercial projects that allowed closed entries. Kebbel said that was dropped because the competition’s strengths did not overlap with the needs of revenue-minded start-ups. The revised closed option is an attempt to broaden the appeal of the News Challenge to more applicants. Those might include people concerned about their ideas being co-opted before a project is released, or employed journalists who plan to leave their jobs if they win (but stay if they lose). One thing that isn’t changing: Closed projects that win the 2010 competition must still adhere to the News Challenge’s requirements to open source their underlying code (an issue of some debate this summer) and release all supporting documentation under Creative Commons licenses. And when it comes time to select winners, closed and open applications will be competing in the same pool. The first of the 2010 projects submitted through the open option are now available for public comment. The terms of service prevent commenters from laying any claim to a project’s intellectual property, even if it’s their brilliant suggestions that vault proposals into the winner’s circle. So what’ll it take to win? As Kebbel said in a June interview with Josh and reiterated to me, the News Challenge is looking for applications from all professions and groups, not just journalists. That could mean computer scientists, engineers, designers, architects, or anyone else with a strong community perspective. In that interview, he also outlined a bit of the process applications go through as they’re winnowed from 2,000-plus to around a dozen winners. And the same News Challenge criteria still apply: successful projects will use digital open-source technology to distribute news and information to a local community. Our June interview is below (transcript here). Many more details are available at the News Challenge site; lots of good questions about the Challenge were answered in this online chat with Kebbel and Jose Zamora from a couple weeks ago. Start cracking on those applications; the deadline’s October 15. 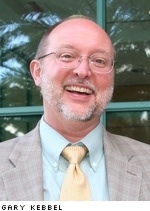 Image of Gary Kebbel by J.D. Lasica used under a Creative Commons license. POSTED Sept. 30, 2009, 10 a.m.
Slocum, Mac. "Shhh! About one third of Knight News Challenge proposals are secret." Nieman Journalism Lab. Nieman Foundation for Journalism at Harvard, 30 Sep. 2009. Web. 24 Apr. 2019. Slocum, Mac. "Shhh! About one third of Knight News Challenge proposals are secret." Nieman Journalism Lab. Last modified September 30, 2009. Accessed April 24, 2019. https://www.niemanlab.org/2009/09/shhh-about-one-third-of-knight-news-challenge-proposals-are-secret/.